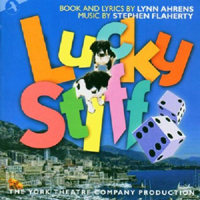 Off-Broadway Cast, 2003 (JAY) (3 / 5) This recording, which followed a five-performance “Musicals in Mufti” run of Lucky Stiff at the York Theatre, is better than its predecessor. 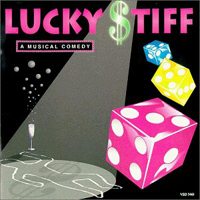 The first recording was made years after the show had closed at Playwrights Horizons, without the participation of the director and with only a few of the original performers; this one has much more of a real cast album feel to it, with a company that had recently been through rehearsals and performances together. In fact, six of the 10 cast members here were also in the first production, though only two of them are heard on the original recording. All of their performances are looser, less frantic, and funnier this time around, with Mary Testa unleashed riumphantly. Among the newcomers, Janet Metz and Malcolm Gets make an appealingly believable leading couple, even if his British accent is a sometime thing. Musical director David Loud’s single-piano accompaniment is more attractive than the elaborate orchestrations of the first recording, which too often strain for comic effect. The material is mostly the same on both albums, though this one has a little more spoken dialogue, as well as the previously unrecorded Act I finale and “A Woman in My Bathroom.” In a bonus track, we get the charming “Shoes,” which was cut from the show. Both CD booklets feature uncommonly ugly cover art. — D.W.